Andhra Pradesh District Selection Commission APDSC 2018 Hall Ticket/Admit Card download from 15th August 2018 from apdsc.cgg.gov.in website. AP DSC, District Selection Comission by Andhra Pradesh Govt. to fill the vacancies in Govt. Schools. 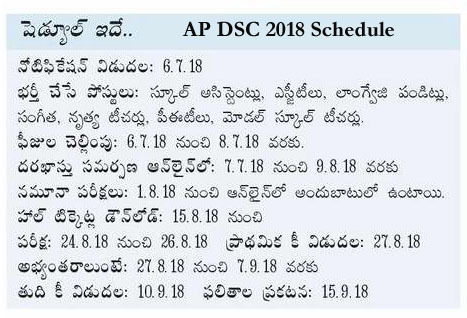 AP DSC 2018 Examinations conducting from 24th August 2018 to 26th August 2018, Hall Tickets download from 15th August 2018 onwards. The candidates who appearing this examination can download their hall tickets or admit card or call letters from 15th August 2018 from dsc official website.